I get the part where it says (page 142) that the rate of a coalescence event is k(k-1)/2 and the rate of recombination is kp/2. The image they have on the same page shows the intensity of coalescence and recombination. But I don't quite understand how those have been calculated. 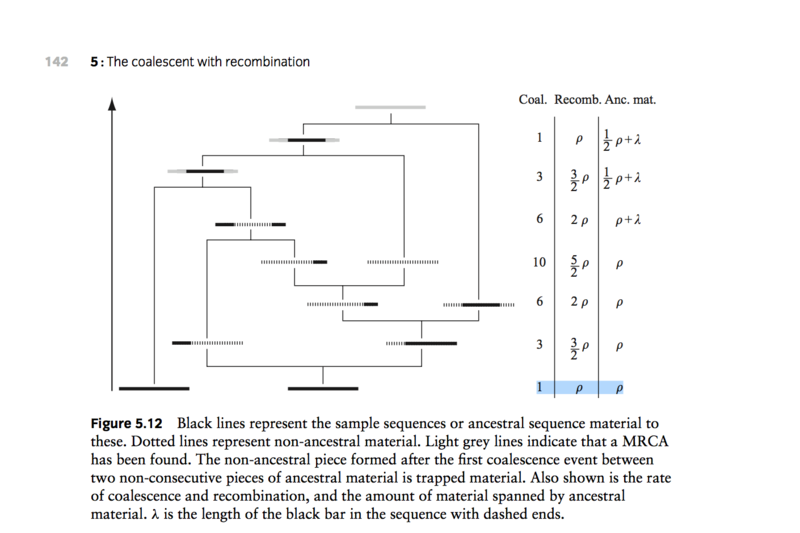 I mean the first event is a recombination event and not a coalescence event. I know they are using the rate formula I've mentioned above but I don't understand what sequences they are considering. If someone can give me a detailed answer I would really appreciate that. Browse other questions tagged population-genetics recombination or ask your own question. How EGDS (endurance genetic distance score) is calculated?